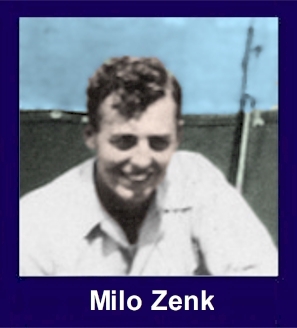 The 35th Infantry Regiment Association salutes our fallen brother, PFC Milo J. Zenk, 37482716, who died in the service of his country on February 8th, 1945 in Luzon. The cause of death was listed as KIA. At the time of his death Milo was 22 years of age. He was from Sioux County, Iowa. The decorations earned by PFC Milo J. Zenk include: the Combat Infantryman Badge, the Bronze Star, the Purple Heart, the Asiatic-Pacific Service Medal, and the World War II Victory Medal. Look in area to the south of the west entrance road, row 3 from west side. 1922-1945 section.